One of the most hyped up sci-fis of the year. It’s a sci-fi that seems destined to become a cult classic. And somebody voted for me to review it. I think the greatest thing about this film is the amount of originality it has. The idea that all mankind has been reduced to passengers on a train is intriguing enough, but every scene has something new to offer. I dig the protection design. The train looks flat-out incredible, and every car has something unique to offer. The costume design and makeup both look great, and my only problem is really the effects. Sometimes, they looked impressive, and other times it looked like something out of a video game. But while the beginning is good, unfortunately, the whole middle of the film just drags. I’m not sure what it is, but I feel that the film just loses quite a bit of steam and the film starts feeling pretty long, and even a little unpleasant, It may be tempting to leave at this point, but I highly suggest you don’t, because It all comes back together for a really exciting and intriguing climax, and the final scene is an image that will stay with you for a while. The cast all did fine jobs. Chris Evans has a scene late in the film where he really gets to show his acting chops, even if said scene admittedly slows down the story a bit. The MVP of the cast, Tilda Swinton, has surprisingly little screen time. But like any great actor, she does the best with the little she has. This is a movie that has some rough spots. Midway through, I felt like giving it 3 stars, but the ending brought it up to 4 for me. I think it is crucial for a film to have a strong opening and a strong ending, so I can forgive this film for having a little leeway in the middle. And I can easily say it’s the second best movie I’ve seen that involves snowy weather and has a majority of the action occur on a train. I think that might have been me who placed that vote. I saw this one on the big screen and it was a pretty good film. 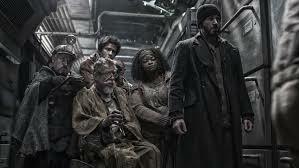 I thought the action was great and liked all the creative environments the characters encounter as they progress through the train. Ed Harris’s surprise cameo was also a nice touch. However, I did feel like the film could have benefited from more female characters. I found it a bit hard to believe that there was only one woman in the back of the train who supported the revolution in any way, and not a single female soldier among Wilford’s guards. It struck me as a bit odd because under the circumstances you’d want anyone you can get, I don’t see why they’d be discriminating by gender.